If reports are accurate, the Nintendo Switch may have needed some compromises to extend its battery life. It's not unusual for specs on a new console to leak out prior to being officially announced, but it can sometimes be difficult to determine just what's real and what isn't. The folks over at Digital Foundry tend to be pretty good at nailing down these sorts of things, and they're reporting that the CPU, GPU, and memory clock speeds for the Switch are now known. What's really interesting about this is how those latter two numbers change when the Switch isn't docked. 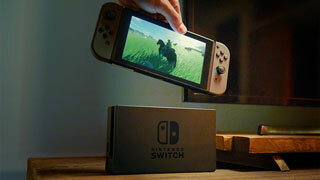 The Switch is apparently running a version of Nvidia's Tegra processor, which is something that we already knew. However, there was speculation that the machine would use the newer Tegra X2, based on Nvidia's Pascal architecture. Digital Foundry reports that they've been told by sources that the spec Nintendo briefed developers with is "in crucial areas...a match for a stock Tegra X1"
But there are some discrepancies, starting with the Switch's HDMI 1.4 specs, while the X1 is HDMI 2.0 compliant. The Switch's pixel fill-rate is only 90 percent of the X1's full capacity as well. Those differences are interesting and worth noting, but where the Digital Foundry report is really interesting is CPU, GPU, and memory clock rates, and how they change when you remove the Switch from its dock. According to Digital Foundry, the Switch's CPU will run at 1020MHz whether the machine is docked or not. That makes sense, as lowering that number could affect how game logic processes, and that's not something that you want to have change. That's not true for the unit's memory controller, which will run at 1600MHz while docked, but drop to 1331MHz while undocked. Developers will have the option to maintain full bandwidth if they desire. While the docked speed of the memory controller matches the top-end potential of the Tegra X1, the CPU clock is basically halved. But as it's constant, it will be less scrutinized than the Switch's GPU clocks. When docked, the GPU will run at 768MHz, about 23 percent lower than the X1's full potential. But when you lift the Switch from its dock, be prepared for that number to drop dramatically - all the way to 307.2 MHz. That's roughly 40 percent of the docked speed. What's even more interesting is that it looks like developers will have the options of forcing the Switch to use those lower clocks even when it is docked. Digital Foundry says that an unnamed developer source compared it to having to create two versions of the same game, much like for the PS4 and PS4 Pro. It's not surprising that clock rates will be lowered when the Switch is undocked. After all, battery life is a legitimate concern, and there will have to be compromises. It's also worth noting what Digital Foundry also points out - even at the mobile clock speed of 307.2 MHz, the Switch should be able to outperform the Wii U. But if your one hope for the Switch was that Nintendo was going to finally roll out a system that would be technologically on par with Microsoft and Sony, this isn't what you want to hear. These specs certainly aren't a condemnation of the Switch, but it is a reminder to temper expectations, as the console we're probably getting isn't going to reshape the world overnight. We'll certainly know more once Nintendo holds its planned January 12 event. If you want to dig even deeper into the numbers, you can find the full Digital Foundry analysis here.